This is the amount originally entered as the landed cost which was distributed across the items in the batch. An order for 10 items is allocated a landed cost of £10, which calculates £1 unit cost. The estimated landed cost in this case is £10. But 11 items are were actually received into stock. The actual landed cost accounted for is £1 x 11, so £11. With the above example the report would show 350 items received at £0.8571 each = 299.985 = 299.99 (2.d.p). But the accounting is created based on order rows where rounding is done per row before adding the results together. This results in the penny difference between the report and the accounting. Rather than hide the discrepancies created by rounding we want to ensure you are able to easily see where discrepancies are occurring so that they can be more easily reconciled and accounted for. In addition, this change also means that any adjustments made to the accounting where the final landed cost was different from the estimate. This means the Actual Landed Cost column shows the actual amount you’ve accounted for, your true landed cost. This purchase order contains 4 different products, totally a quantity of 350 items, plus a shipping charge of £300 which will be allocated as the landed cost. The landed cost report will show the sum of these values. If you click on the value displayed on the report it will drill down to the general ledger with these filters applied so that you can see all of the detailed accounting entries. Go to Accounting > Enter Journal . Select the landed cost nominal code to adjust and enter the value to adjust by. This should be the same code as displayed on the landed cost report for the landed cost you are adjusting. Add a new row and specify where the adjustment is being posted to, for example 5000 Purchases will post the difference directly to cost of sales. Go to Reports > General Ledger and click to edit the journal. 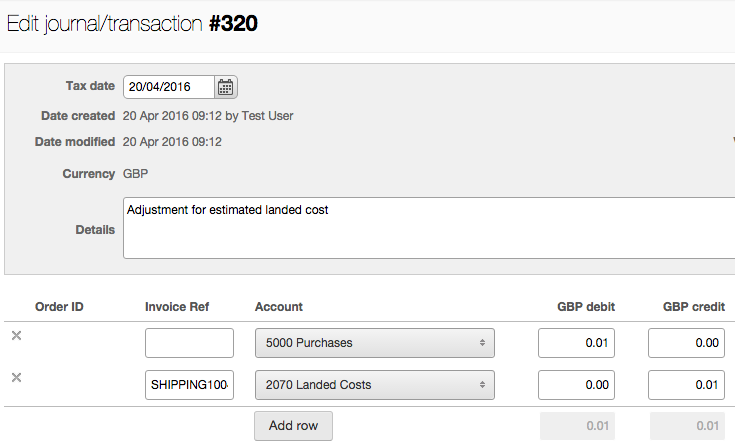 Enter the landed cost reference in the invoice ref field for the landed cost nominal row, exactly as it appears on the landed cost report for the landed cost you are adjusting. Go to Purchases > Landed Cost Report to see the Actual Landed Cost value has been updated by your adjustment. Click on the figure to see the accounting details, including your adjustment entry. Each landed cost should always be given a unique reference. This enables your bookkeeper/accountant to view all the related accounting and reconcile each landed cost invoice as it arrives. This is also how Brightpearl calculates the actual landed cost for the report - by looking accounting using the landed cost reference. If your landed cost references are not unique then the accounting entries will be reported for multiple rows on the landed cost report. This does not mean that your accounting is wrong, just that it’s not possible to distinguish between the accounting for one landed cost and another. If you’re happy that the accounting is fine and balances you can mark the landed costs as reconciled and leave it as it is. Once marked as reconciled the item will be filtered out of the screen. But we recommend you start using unique references from now on. This might be the quote reference or if you’re using your own reference why not try adding the PO reference on the end?